Fresh off announcing the Galaxy Note 8, Samsung could have another device ready to show off soon — one that could be of particular interest to virtual reality fans. 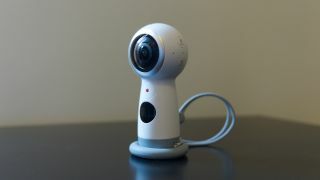 Samsung has filed an application with the European Union Intellectual Property Office for what appears to be a camera called the 360 Round, according to Mobielkopen. The application uses tags like "digital cameras," "multiframe view cameras," "camera mounts" and "tripods for cameras", implying the 360 Round could be a VR-capable camera of some kind. As one could guess, the title and abstract description aren't far cries from Samsung's line of Gear 360 cameras, which can collect VR-ready, 360-degree video footage to be enjoyed on headsets like the Samsung Gear VR. Considering Samsung just unveiled the Gear 360 (2017) camera earlier this year, it's unclear what the supposed 360 Round will do to distinguish itself. That is, of course, if it's real, as Samsung has yet to formally announce the device. That said, with IFA 2017 underway this week, we hope to hear more about what Samsung has to announce, especially as it pertains to any 360-degree filmmakers out there.